Last week I got a call from a friend in Appelton who had purchased Georgia Freestone peaches from a truck, and was quite beside himself, telling me that I need to get some. We love Freestones. 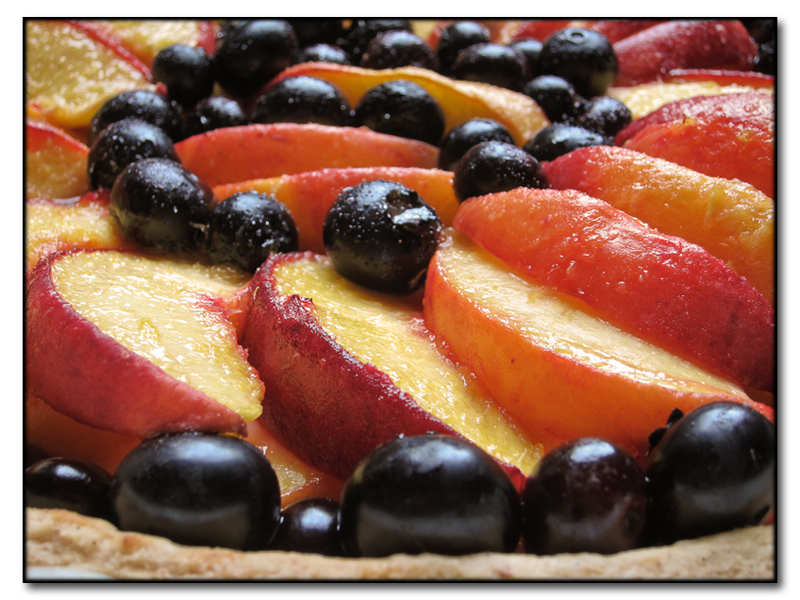 When we lived near San Francisco we would make an annual run to the San Joaquin valley for ripe peaches and freeze them. These are not as massive as those in CA, but they are large, full of flavor, sweet, and when bitten into offer a mouth feel that screams FRESH! We bought a box and will freeze most of them for eating thru the winter. Our box weighed 28 pounds, contained 61 fruit and cost $33, cash or check. At our visit the company was test marketing blueberries. I picked up a 5 pound box ($15). 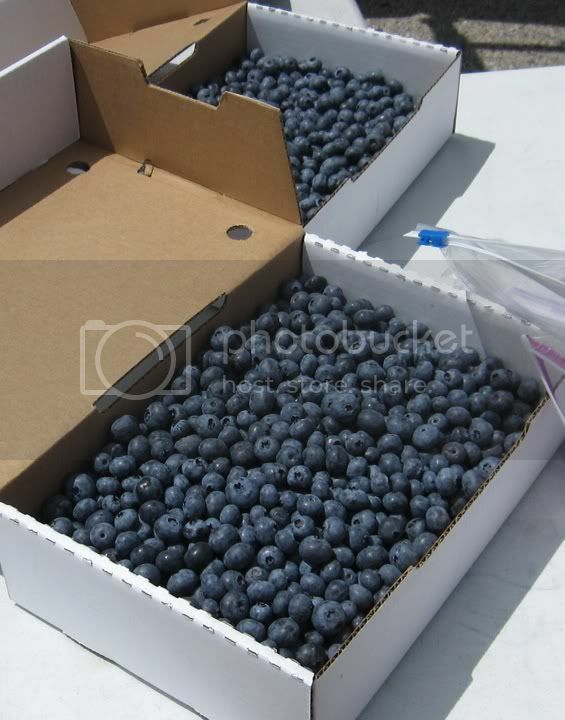 They are huge, sweet, gorgeous and full of blueberry flavor. They serve Wisconsin and a few places in the far western burbs of Chicago. As we live in the far outreaches, somewhere between ORD and Lake Geneva, this works for us. I post so that other LTH'rs who live way out here can catch the Georgia Freestone peach season, which runs a little into August. The truck pulled up exactly as scheduled at noon in the Menard's parking lot in south Racine. Folks were waiting, and a steady stream of peaches and blueberries flowed from the truck for 90 minutes, whereupon they closed and drove off to another site, no doubt with a waiting crowd. Their locations and schedule are posted on their website. Thank you for the review and recommendation, we love to hear feedback from customers about our fruit. 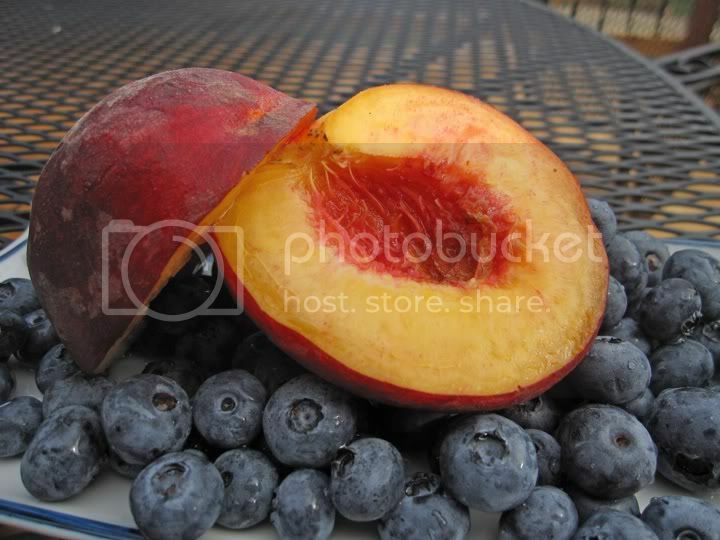 Those are some excellent photos, I really like the peach on top of the blueberries, it looks absolutely mouth-watering! 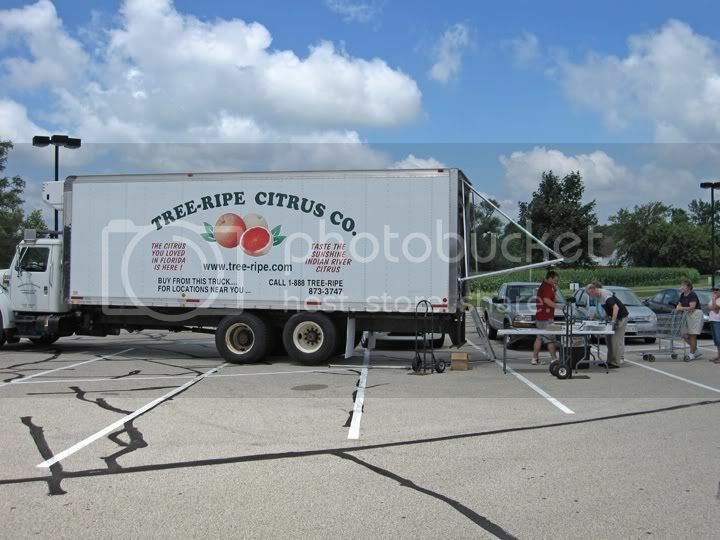 We've been bringing fruit to Wisconsin and Illinois since 1990, delivering Florida oranges and grapefruit in the winter and Georgia peaches in the summer right from our truck, as seen in the pictures. We'll be visiting the Chicago-land area this coming Saturday, July 17 in Gurnee and Crystal Lake and again the following Saturday, July 24 in Batavia, Elgin (East Dundee), and McHenry (Johnsburg), check our website for locations and times. Stop by the truck and see the peaches for yourself, and talk to our returning customers that are in line, they're usually more than happy to give their personal opinions on our fruit. Thanks, it's always good to know of new opportunities. There are other trucks which do this stop, sell and go practice. When Villiard's Farm Stand was still located at 120 and 83, there was a periodic visit of a truck filled with Gulf seafood. Periodically a postcard would arrive with dates, times and seafood they expected to sell. The Villiard's have largely retired, except for selling Christmas trees. I noticed on the tree-ripe website that the peaches come from Pearson Farms, which is literally right down the road from our house. Well, maybe 50 miles. We go to the Macon State Farmers Market for produce and we got a load of freestone peaches last Saturday. They were from a small grower near Fort Valley. One of the interesting things about the biggest peach producer (Lane Southern Orchards) in the world is that they put the peaches through a scrub/wash that removes the fuzz. When I first saw the smooth peaches on the line I thought they were nectarines. I should have asked why they choose to remove the fuzz. Unfortunately, they also apply the typical food-grade wax coating. That's one of the reasons we buy from the small producers...nothing but peach in the basket. But, we did get a couple of "Little Dink" cantaloupes at Lane. Very tasty and about half the size of a regular melon. Anyway, the peaches have been eaten out of hand, and turned into peach crisp. Just great...juicy yet firm with a taste that can't be beat. Thanks for posting- I love peaches, especially frestone, and I am so often throwing away anything I bother to buy in a grocery store, that I just don't bother to buy them except at the farmers market anymore. I think they will be seeing me this Saturday. Does anyone know the best way to freeze the excess peaches? @little500: Yes, many of our peaches come from Pearson Farms, but we also do get some from Lane as well, and even Big 6 Farms on occasion, as they're all part of the Georgia Peach Commission. We typically go through a truckload every day or two, so it's all about which packing house has a truckload ready to ship. They are all very good about picking only the ripest peaches, and letting the green ones continue to mature rather than picking them early. I want to freeze our peaches, but these days I want to stay away from added sugar. Can I simply freeze them in their own juice (they certainly don't seem to need any sweetener)? Or perhaps add a certain amount of fresh OJ to contribute citric acid? Yes, you can freeze without the sugar. Although I've not personally tested it, I've seen on numerous sites that say that artificial sweeteners can be used for freezing peaches instead of sugar. I've also been told that apple juice works well instead of OJ. 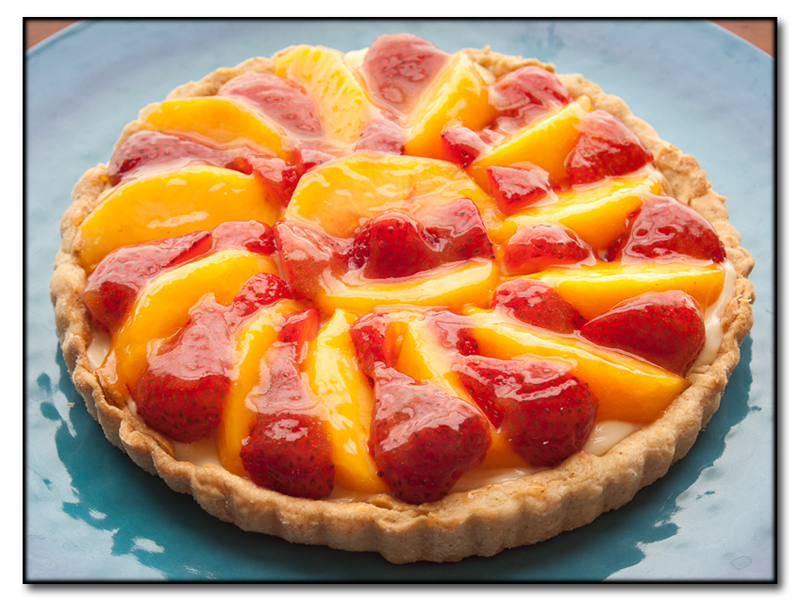 You may need to use another anti-darkening method, like Fruit Fresh, when going sugar-free, not sure if the OJ alone will prevent the peaches from browning. anyone interested in meeting up for lunch before? WOW! Great peaches!!! ours started to come around last night and I've had 4 this morning. 62 in the $34 box well worth the drive. I made a cobbler yesterday with 7 of them that is just about gone. Working on a peach tart using a pâte brisée featuring almond flour from "The Complete Robuchon"
hope to make a nice image later today! Last edited by mhill95149 on July 19th, 2010, 11:59 am, edited 1 time in total. There are other trucks which do this stop, sell and go practice. When Villiard's Farm Stand was still located at 120 and 83, there was a periodic visit of a truck filled with Gulf seafood. Periodically a postcard would arrive with dates, times and seafood they expected to sell. This is probably Fabian Seafood out of Galveston who have sold seafood around the Chicago area for years. We have bought from them many times over the years, wonderful sweet tasting shrimp and sometimes whole fresh red snapper. For the last 6-7 years they have been regulars at the Saturday Naperville market but back in May sent out cards that they would be suspending their deliveries to the area. This has been a wonderful company to deal with and I sure hope thye can rebound. It was definitely Fabian. I'm sorry to hear they suspended deliveries here. I was sorry I had lost contact with them. Glad to see people are enjoying the wonderful Georgia peaches this summer. It always warms our hearts to see how happy and excited our customers get each summer when the peaches arrive. We'll be making one last visit to the greater Chicago area this summer with peaches, and then won't be back again until December with Tree-Ripe Florida oranges and grapefruit. Saturday July 24th, 2010, our peach truck will be in Batavia, Elgin/East Dundee, and McHenry/Johnsburg. Check our website, http://www.tree-ripe.com, for times and locations if you're interested in getting a 1/2 bushel box of delicious, freestone, Tree-Ripe Georgia peaches, just days from the tree. Evil Ronnie and I bought Michigan peaches at the Daley Center farmer's market yesterday and they are heavenly! They are what a peach should be: sweet, juices dripping down your chin, etc.. They will probably be at Federal Plaza on Tuesday. Last edited by NFriday on July 23rd, 2010, 4:34 pm, edited 1 time in total. FYI, while I fully support local farmers and farmer's markets, Michigan is no more local than Georgia And being a small family business based in Johnson Creek WI, we're probably even more "local" to the Chicago area than the MI peach sellers in IL. Although MI peaches are also delicious, for our purposes, we aren't able to get any significant amount of peaches from Michigan, as compared to Georgia. We need a truckload of peaches each day during our season, but some of the biggest growers in MI simply can't produce that quantity on a regular basis. We did try some MI blueberries on our route this season, as seen in the original post, and they sure turned out good. And despite the implication otherwise, our customers know full well where our peaches come from, either Lane Packing (http://www.lanepacking.com) or Pearson Farms (http://www.pearsonfarm.com) in Georgia, two of the best peach growers in the world. Also, our fruit is always tree-ripened and mere days from the tree, taking 2 days to get to WI/IL from GA after being picked and packed, and on our route for sale the following day. Just to correct those assertions. Got another one in prep right now with a pastry cream filling. 62 peaches purchased and now 6 days later we have 10 left! Peaches that are 2-3 hours away are certainly more local than those shipped 750 miles away. If we don't support the local orchards and the local supermarkets (independents and chains) who source regional produce, we will have to truck in produce in the future. Peaches from Michigan at the Green City Market are certainly more local to me than peaches from Georgia in a parking lot in Elgin. Mike G wrote: Peaches from Michigan at the Green City Market are certainly more local to me than peaches from Georgia in a parking lot in Elgin. I wholeheartedly agree. Michigan is local, as far as I'm concerned. That said, thanks to the very generous stevez, I am now in possession of some of these Georgia peaches (he went out and grabbed some last weekend) and they are really effing good. They're sweet, tart and perfectly ripe. Their peachy aroma is magnificent. Of couse, I look forward to the local stuff even more. I was in Michigan last week and while it's still a bit early, several farmers I spoke to were very optimistic about their upcoming crops. I've found the peaches at the Green City Market to be outstanding this year . . . best I can remember. A rest of one to two nights on the kitchen counter and they're perfectly ripe, and as sweet and tart as a peach should be. Most recently, I picked up about 15 lbs of peaches at the Market from Hillside Orchards which is located in Berrien Springs, Michigan, just south of Benton Harbor. These were the best peaches I've had in years - made a couple of pies with them, grilled a few others, and I've been eating the rest just as they are. Slightly off topic, but the blueberries have also been outstanding this year and much better than I recall them being in the past couple of years. BR wrote: A rest of one to two nights on the kitchen counter and they're perfectly ripe, and as sweet and tart as a peach should be. At Farmer's Markets I've been to in Ohio, NY, and Washington D.C., peaches come to market already ripe, having matured on the tree rather than the counter. Perhaps because yields here are lower, our local farmers bring them to market hard as a rock, fearful of losing too much of their precious product. I can't say they're wrong: at the Dupont Circle market I witnessed hundreds of peaches being tossed into the compost heap because they had been overly bruised or rotted. I can, however, say that our local method leads to inferior peaches. 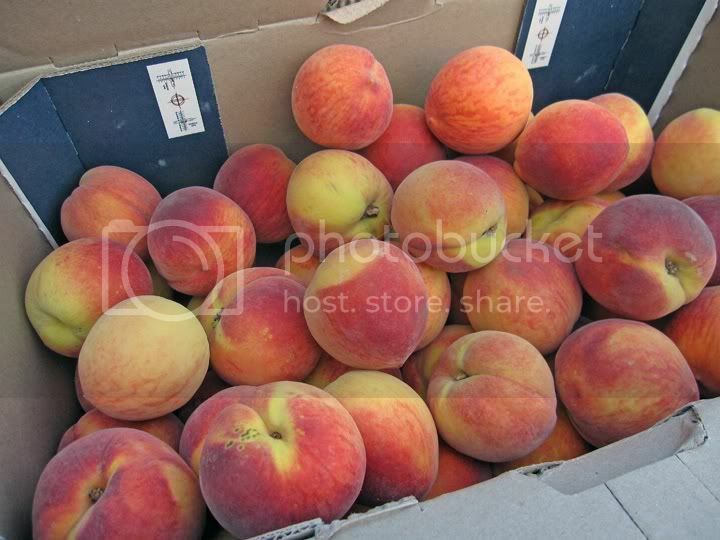 BR wrote: I've found the peaches at the Green City Market to be outstanding this year . . . best I can remember. I used to think that Michigan peaches were the platonic ideal of what a peach was supposed to be...that is until I tried South Carolina peaches. They are in a whole other league, and their Georgia cousins are nearly as good. I'm all for eating local whenever possible, but if there's a vastly superior product on the market, it's hard for me to justify doing so. I'd no sooner opt for Michigan peaches simply for the sake of eating local than I would opt for Georgia corn if I lived there.